Feminine and romantic with vintage vibes and a boho feel — this full-length, A-line gown features a striking bodice with exquisite eyelet lace with sweet floral motifs. A deep sweetheart neckline adds some modern sexiness to balance out the slightly high neck and cap sleeves. 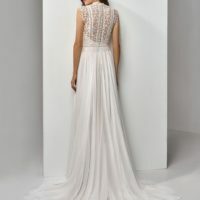 Light chiffon is a soft, dreamy complement to the bodice and matching illusion eyelet lace back with covered buttons and invisible zipper closure.